What's wrong with this picture? Everything. 1) Despite the food styling, flattering lighting, airbrushing and god knows what else this sandwich was subjected to in preparation for its big showcase, it looks inedible. 2) Only a fool would pour gloopy barbecue sauce on top of pulled pork. Then again only a fool would order a BBQ sandwich at Subway. It makes the gray, lifeless Philly cheese steak Jared’s benefactors hawk look almost appealing. 3) Only someone out to harm our nation’s vital interests would place pork barbecue on top of lettuce on a sandwich. The Department of Homeland Security should stop frisking infants and the infirm and focus instead on this serious threat to America. 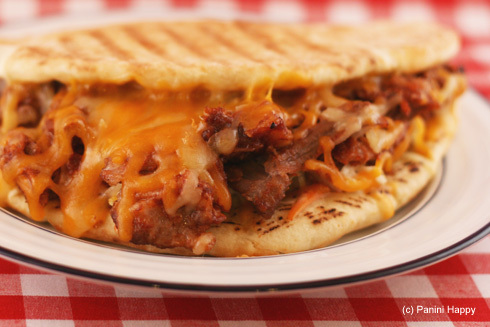 4) A barbecue sandwich where the bread is a sub roll? No thanks. 5) The tagline “Get Pulled In” is more of a threat than an invitation, particularly when paired with the BBQ sauce bullseye/vortex pictured to the right of the sandwich. I could go on but you catch my drift. Could it really be as bad as it looked? As the nation’s most fearless North Carolina-based Jewish barbecue journalist, I knew I could not rest until I hunted down the Abominable Pulled Pig in its natural habitat. How else would the public be made aware of this imminent threat to the American way of life? On the way back home from D.C. I made a pit stop in Rawlings, the scuba capital of central Virginia. It was there, under the harsh flourescent lights of a Subway/gas station/Dunkin Donuts that I spotted the beast. Luckily, I was protected by a sparkling clean glass sneeze guard and was able to photograph the pulled pork without risking life and limb. 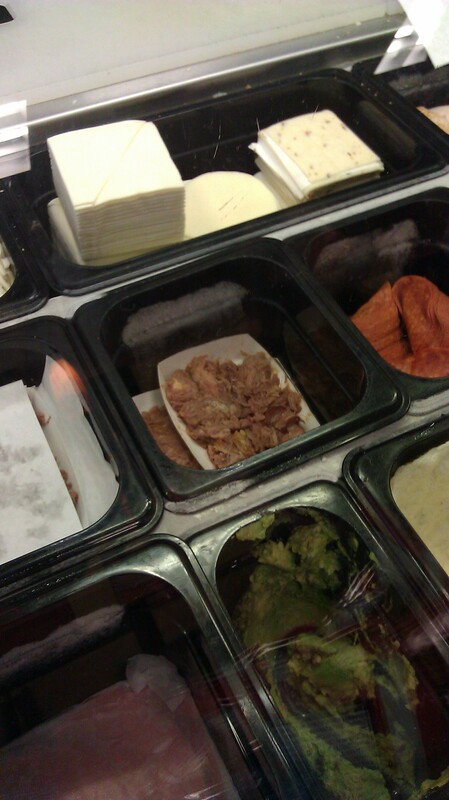 As the sauce-stained pork lay silenty in its black plastic cage, reconciled to its fate, I suddenly felt sorry for it. While other pulled porks were cooking away over wood coals with salivating customers eagerly awaiting them, this pork was all alone despite its crowded surroundings. Pepperoni, provolone, guacamole and the like have nothing to offer a proud pulled pork. 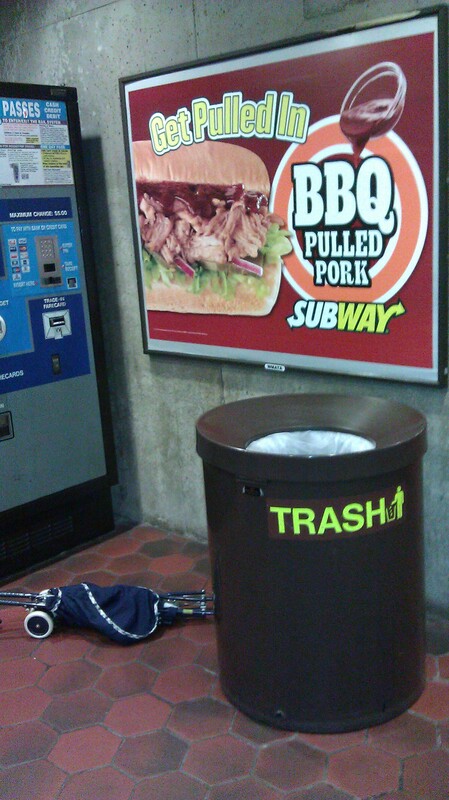 Sure, other pulled porks don’t get displayed on a poster in the Metro or a digital billboard near Petersburg, but was the fame worth it? Was its life really going to come to an end on an Italian roll being served to an unappreciative BBQ Jew?